A caption below the photos read, "Sleigh Ride Barbeque. A perfect way to end the day in Snowmass is a brisk ride by sleigh, drawn by a team of Belgian draft horses, to a secluded mountain cabin where you hosts from the Snowmass Stables greet you with a hearty barbeque and live Western entertainment. Other off-slope attractions in Snowmass include cross country skiing, dog sledding, guided snowshoe walks, hot air ballooning and professional repertory theater." 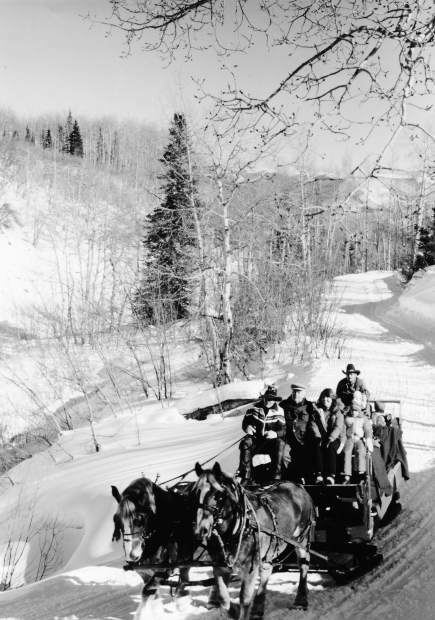 Between “taxi” rides through the village and daily rides from the village to the golf course, special events and evening rides to the Divide cabin with entertainment by Bob Cutting and Ann Rollins, the horses and Call were never sitting still for long.